Hammer-ons are one of the four basic types of guitar slurs, a “slur” being a technique used (as far as it applies to the guitar) to create a note with the fretting hand as opposed to the picking hand. While the idea behind the technique of each slur is fairly simple (you essentially do exactly as the name of the particular slur instructs you to do), they can involve a bit of time and practice for many beginners. 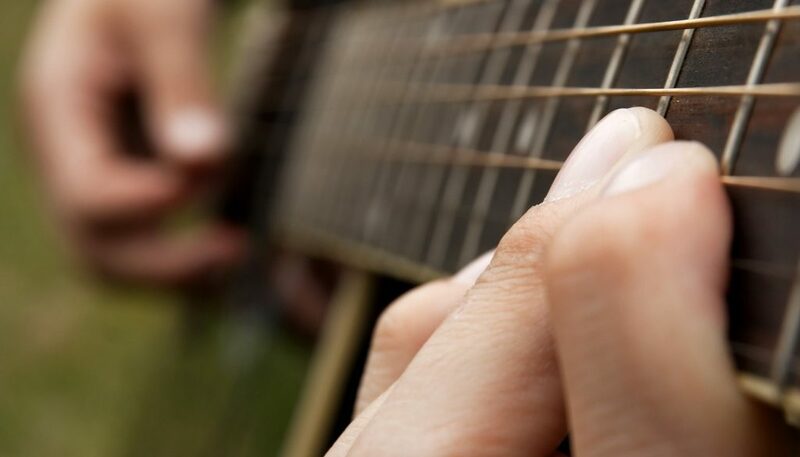 To perform a hammer-on, you hammer a finger of your fretting hand onto a specific fret of a specific string after you have already picked, plucked, or strummed that string. In music notation and guitar tablature, a hammer-on is usually indicated by a small “H” placed above the arc of the slur, as you can find in many of our lessons here at Guitar Noise. Just as an example, take your guitar and pick the open D string and let it ring. Then hammer a finger (use your index finger to start with) onto the second fret of the D string. Bring it down onto the string hard and fast! You want to pick the D string only once with the pick. It’s your index finger hammering the string at the second fret that creates the E note you should hear. Once your finger makes contact with the fretboard, keep it there. The temptation is to let it go as soon as you make perform the hammer, but it’s the finger staying in place that keeps the second note ringing. If you’ve never tried this before, chances are that the second note will sound fairly faint, if at all. You’ll find it helps at first to exaggerate the motion of the technique. Really whack the finger onto the string, putting some speed and strength into it. And make certain it’s the tip of the finger that’s making contact with the string, just as it is when you regularly fretting a note. As with all slurs, hammer-ons are far simpler to explain than to execute. If you’re not used to performing this technique you probably haven’t yet built up neither the finger strength nor the speed required to be consistent and accurate in making hammer-ons. But you will. As you get more accustomed to playing hammer-ons, you’ll find you don’t have to exaggerate so much to get the speed and strength you need. And I should note that, as a teacher, I’m not really keen on using the word “speed” as part of the hammer-on technique because it’s easy for beginners to think of speed simply in terms of rhythm and tempo and not as part of the mechanical aspect of making a hammer-on. While slurs like hammer-ons can almost immediately make you a speedier guitarist, you have to remember to watch your timing! Just because you can use a hammer-on to move quickly from one note to the next doesn’t mean you should. In other words, not all hammer-ons are done as grace notes (and if you’ve forgotten what those are, check out our mini lesson on grace notes. Be sure to read the rhythm values of slurs and play them with the appropriate timing. In performing hammer-ons, finger speed is important to minimize the energy loss that occurs between the sounding of the first note and the “re-stopping” of the new note as the hammering finger makes contact on the fretboard. Even though you want to use enough finger strength to sound the hammered note cleanly and clearly, you ultimately want to keep your fingers fairly close to the strings, ideally not more than a half-inch. Being that close to the neck, it’s the speed and strength of the fingers that makes the hammer-ons sound cleanly. Again, this may seem a bit difficult at first, but as you gain confidence in your fingers, both in terms of strength and speed, the technique will become second nature. Paying attention to the timing of your slurs, as well as developing strength and speed in all your fingers, becomes more important when you start working on hammer-ons from one fretted note to another and multiple hammer-ons, You can read more about this technique in our lesson, Tricks of the Trade. Finally, while hammer-ons are a staple of playing lead guitar, they are also an essential tool of the rhythm guitar player. The addition of hammer-ons and other slurs makes your strumming sound a lot better, not to mention more interesting. You might want to check out our Guitar Noise Podcast# 2 that deals with this very topic. When you’re first learning hammer-ons, try to use them in all your playing, whether rhythm or lead, in order to get comfortable and confident in your abilities. You’ll probably find them impossible not to use!